Get ready to learn everything about Marvel’s mightiest Super Hero team—their stories, their powers, their allegiances, and their enemies. Exciting comic-book art on dynamic page design gives a stylish and up-to-the-minute look, while information is presented through character profiles covering key issues, storylines, and topics. This updated and expanded edition covers major post-2012 storylines and their key comic book issues. 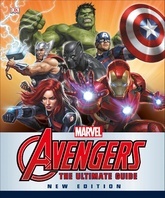 Fans will be treated to 18 action-packed pages of new content, including updates on the Avengers’ career timeline and existing character histories. Plus, you’ll find profiles of new stars, such as the new Wasp (Nadia Pym), Thor (Jane Foster), Captain America (Sam), and Ms. Marvel (Kamala Khan).